Provide comfort for the family of Basadei Salisbury with a meaningful gesture of sympathy. It is with great sadness that the family of Basadei ‘Rhoda’ Salisbury announces her passing on Saturday January 19, 2019 at the age of 81 years. 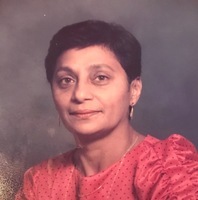 She will be remembered by her two sisters Rajmat (Karan) and Edna (Baloobeer), her three brothers Neil (Carmen), Shawn (Kathy) and Pradeep (Mona). Her nieces, nephews, great nieces and nephews. Rhoda was predeceased by her husband Mortimer Salisbury. Memorial donations in memory of Rhoda can be made to St Thomas Anglican Church -1567 William Ave W.
To send flowers in memory of Basadei Salisbury, please visit our Heartfelt Sympathies Store. We encourage you to share your most beloved memories of Basadei here, so that the family and other loved ones can always see it. You can upload cherished photographs, or share your favorite stories, and can even comment on those shared by others.